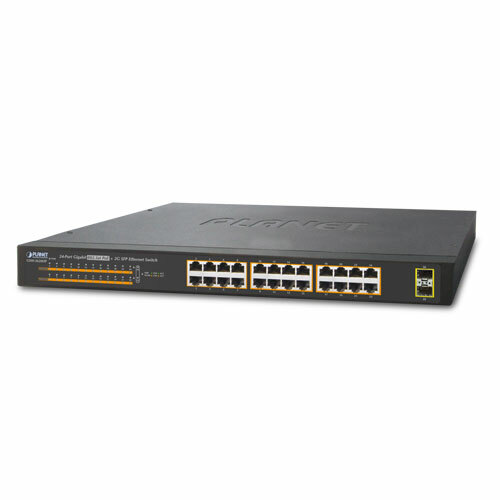 PLANET GSW-2620HP, an ideal Gigabit PoE Switch, provides a cost-effective advantage to local area networks of SMBs. Offering Layer 2 data packet switching and stable operation, this model also complies with IEEE 802.3at Power over Ethernet Plus (PoE+) at an affordable price. The GSW-2620HP is equipped with 24 10/100/1000BASE-T Gigabit Ethernet ports and 2 1000BASE-X SFP interfaces with inner power system. 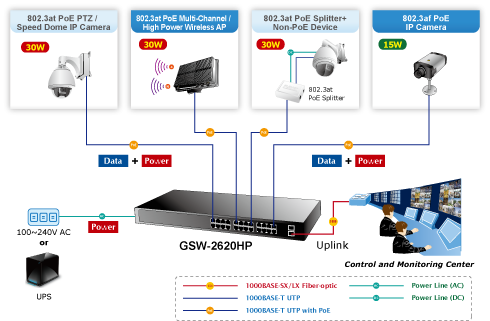 Its 24 Gigabit Ethernet ports are integrated with an 802.3at PoE+ injector function. It offers a rack-mountable, safe and reliable power solution for SMBs deploying Power over Ethernet networks. The PoE in-line power following the IEEE 802.3at/af standard makes the GSW-2620HP able to deliver Gigabit speed data and up to 30 watts of power per port to 24 PoE compliant powered devices (PDs) with a combined power output budget of up to 220 watts. The GSW-2620HP provides more flexibility in power requirement for all kinds of PDs with affordable installation costs. The Idle Mode Link Down power saving of the GSW-2620HP complies with IEEE 802.3az Energy Efficient Ethernet (EEE) standard to automatically lower power for a given port when it is not linked. The Intelligent Scale Power technology actively determines the appropriate power level based on the cable length. When connecting to the GSW-2620HP with Ethernet cable shorter than 20m, a device can obtain maximum power saving because the GSW-2620HP would automatically detect the Ethernet cable length and reduce power usage. The connected device can substantially reduce the overall power consumption, which makes a significant contribution to energy saving. Providing data transfer and high PoE in one unit, the GSW-2620HP is able to reduce the need of extended cables and electrical outlets on the wall, ceiling or any unreachable place. It helps to lower the installation costs and simplify the installation effort. All RJ45 copper interfaces of the GSW-2620HP support 10/100/1000Mbps auto-negotiation for optimal speed detection through RJ45 Category 6, 5 or 5e cables. It also supports standard auto-MDI/MDI-X that can detect the type of connection to any Ethernet device without requiring special straight-through or crossover cables. The two mini-GBIC slots built in the GSW-2620HP are compatible with the 1000BASE-SX/LX SFP (Small Form-factor Pluggable) fiber transceiver, uplinked to backbone switch and monitoring center in long distance. The distance can be extended from 550 meters (multi-mode fiber) to 10/20/30/40/50/60/70/120 kilometers (single-mode fiber or WDM fiber). They are well suited for applications within the enterprise data centers and distributions. 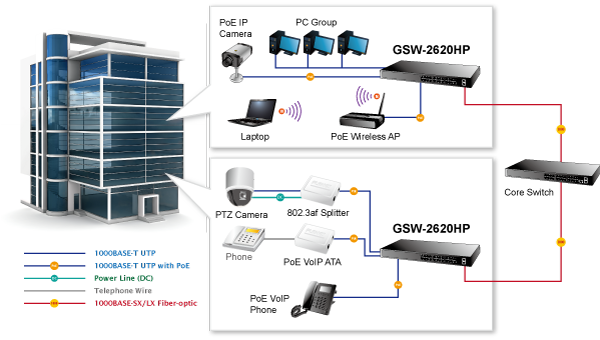 The GSW-2620HP brings an ideal, secure surveillance system at a lower total cost; the GSW-2620HP provides 24 10/100/1000Mbps 802.3at PoE ports able to feed sufficient PoE power for 14 IEEE 802.3af/7 IEEE 802.3at PoE IP cameras at the same time. It is also able to connect with one 16-channel NVR or two 8-channel NVR systems, uplinked to the backbone switch and the monitoring center. 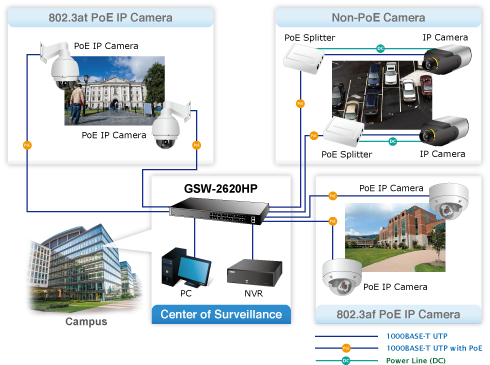 With such high-performance switch architecture, the recorded video files from the PoE IP cameras can be saved in the NVR system to enable the administrators to control and monitor the surveillance images both in the local LAN and the remote sites. 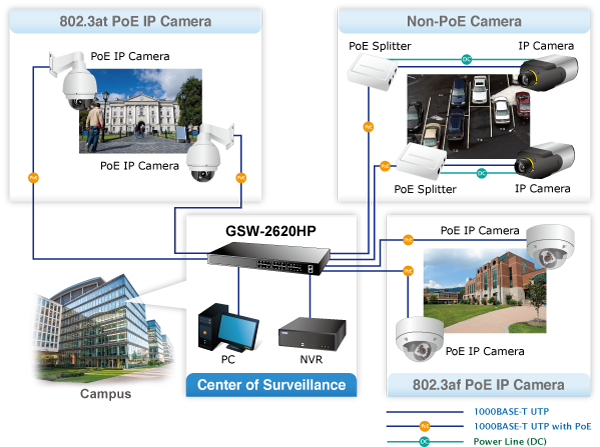 Providing 24 PoE in-line power interfaces, the GSW-2620HP can easily build a power where IP phone system, IP camera system and wireless AP group for enterprises can be centrally controlled. 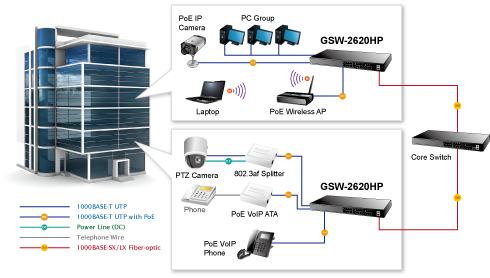 The GSW-2620HP delivers full ports of 802.3af/at compliant Gigabit Ethernet network connectivity with high-performance and cost-effective advantages for the increasing number of PoE IP telephones, PoE IP cameras, PoE wireless access points and other devices applied at the edge of the small or medium enterprise network.